Consumer Action teams up with California non-profits to train California CBO staff on our Empower U module covering phone and TV service. 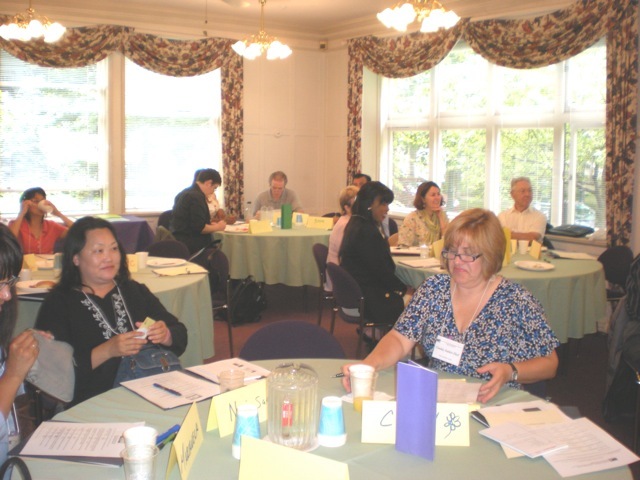 Non-profit agencies attend the Empower U training in the San Francisco Bay Area: Front left table (L-R): Marianela Mendoza, Women's Initiative; Nai Saelee, Tri-Valley Housing Opportunity Center; Cindy Sutter-Tkel, The Salvation Army; back left table (L-R): Ming Chang, Cameron House; back right table (L-R): Nancy Inotowok, Rubicons Programs Berkeley, John Giles, Community Action of Marin, Bhi, Timsina, Lao Family Community Development, and front right table (L-R): Linda Washington, Kai Ming, Inc.; Peggy Green, Money Management International, Nimia Ramos-Beauchamp, The Unity Council and Jay White, Legal Aid Society of San Mateo. Consumer Action’s Outreach and Training Team in July partnered with Temple Community Outreach Center in San Bernardino to train 24 CBO staff from Orange, Riverside and San Bernardino counties. The San Bernardino training drew representatives from faith-based, social services, legal services, credit counseling, community action, women’s, youth, health services and deaf agencies. Consumer Action partnered with Lao Family Community Development, Inc. in Oakland to train 20 CBO staff from San Francisco Bay Area organizations in August. The Bay Area training drew staff agencies providing housing services, credit counseling, childcare, legal services, workforce development, small business development and student services. At both trainings, Community Outreach Managers Nelson Santiago and Linda Williams led the classes and discussions. Williams opened the training with the Test Your Knowledge About Wireless Communication Quiz. The quiz is designed to jump start the conversation about wireless and to provide an overview for the topic. Santiago led the discussion on managing the costs of wireless phone service, Internet and television and cable service. Often times, he said, consumers think that they have to eliminate necessities to trim their budgets, when a check-up is all that's needed. He provided cost saving tips that groups can use to educate their clients on how to determine wireless phone service usage, select appropriate plans, cut costs and protect privacy. He elaborated on the various options for accessing the Internet (dial-up, DSL, cable broadband and fiber optic) along with estimates for each type of service. Santiago also discussed the ways in which people view television has changed. Not only are consumers able to watch television on cable and satellite, consumers can stream television from their computers, gaming systems, DVR, mp3 player, tablet or smartphone as well as watching programs from a digital converter box. These new ways to view television give consumers different options at different price points. Santiago stressed the importance of educating clients about privacy rights, fraud prevention and recovery steps for victims. Following his presentation, Santiago led the group in an activity to test the group on the information he covered, and showed the leaders how to adapt the materials for a small group. Williams trained participants on accessible wireless phone features. As technology has evolved, so has the equipment for the disabled. Some of the accessible features include: audio and visual vibrating, closed captioning, silhouette compatible and video conferencing. She discussed how to select a hearing aid compatible device and resources for the hearing-impaired community. Williams also discussed fixing leaks in the budget by disputing bill overages, monitoring service usage and making informed decisions by reading all of the fine print. She trained the CBO staff on how to teach their clients to identify different types of telecommunications fraud, deal with billshock and dispute erroneous charges on their bills. She also talked about the rules that govern telemarketers, how to stop the unwanted calls from telemarketers and handle complaints against telemarketers. The Empower U curricula includes: four fact sheets, power point slides, a power point companion guide and interactive activities. Click here to get the entire package. Consumer Action developed the Empower U curricula with a grant from the California Consumer Protection Foundation.